When the temperature drops low enough for long enough, the canals become sparkling highways through the city. Skating over Amsterdam's frozen canals is not possible every year. The temperature needs to drop to -5°C or below for 1 or 2 weeks to get natural ice (natuurijs) thick enough to skate on. During periods of cold, boat traffic is blocked from certain canals (usually Keizersgracht en Prinsengracht) to allow the water to freeze. Skating on the canals of Amsterdam to the strains of classical music is a memorable experience. Little kiosks are set up on the ice to dispense heart-warming liqueurs. Go cautiously when skating under bridges, where the ice is usually thinner, and in general don't go anywhere the Dutch themselves don't. 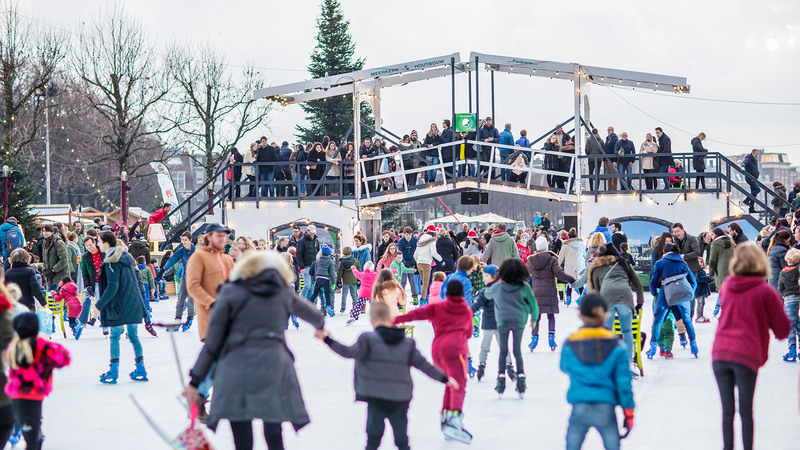 Around Christmas and New Year the Museumplein and Rembrandtplein will have an ice rink, skate hire and surrounding poffertjes (mini pancakes with powdered sugar) and oliebollen (doughnut ball) stalls to complete a Dutch winter wonderland feeling. Every winter, the pond in front of the Rijksmuseum on Museumplein is transformed into a real ice rink. Bring your own skates or hire some there. In the evenings it will be festively illuminated. Ice skating, hot wine, colourful lights and winter delicacies - once again this year you will find the cosy ice rink in the middle of Rembrandtplein square, between many cafés and restaurants. At the rink you will be able to hire skates if you don't have any yourself. Oliebollen, poffertjes, waffles and braadworst (bratwurst) are served up in little stalls around the rink. The Jaap Eden Baan's marvelous outdoor 400-metre lane, named after the legendary multiple Dutch world champion ice skating and cycle racing, is popular in wintertime. Adjacent to the rink is an indoor ice hall (Jaap Edenhal) used for figure skating and ice hockey.